S.A.F.E. Structure Designs provides solution-driven aviation support equipment to both the military and civilian aviation sectors. 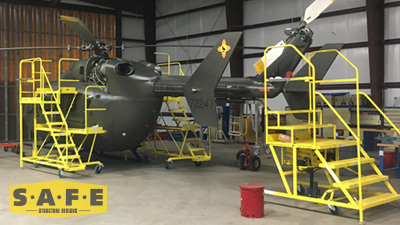 We specialize in the innovative design and manufacturing of “S.A.F.E.” aircraft maintenance stands, fall protection platforms, hangar equipment, portable field equipment and specialty tooling for all aviation applications. We've worked alongside aircraft mechanics around the world to design products that not only meet, but exceed the expectations of the aviation industry. Our industry-leading platforms for rotor and fixed-wing aircraft will increase your mechanic’s efficiency while providing a safe working environment. You expect a lot out of your aircraft, and you should expect even more from your aircraft maintenance support equipment. That's why we work closely with aviation maintenance technicians to create custom designed, precision-manufactured aviation safety equipment that delivers enhanced protection for your team. We'll work closely with you and your team to understand and define your exact requirements, and this process ensures that we provide the best solution to your unique aviation maintenance requirements. Our design process is a collaborative effort between your staff and our design team, and is completely free of cost to you. Check out our video to learn more about our design process. We'll design your vision on our dollar… so why not give us a try? We offer custom aviation maintenance platforms and safety equipment for all major rotor wing and fixed wing aircraft manufacturers. A few of our top brands are listed below. Don't see your model here? Contact Us, chances are we can work with you on a customized solution. SAFE Structure Designs has number of customized maintenance and safety platform solutions for our clients. Click on a category below to view a gallery of projects we've completed for various clients in the Aviation sector. Looking for more information about our products? Contact us here.